Project Tracking: Are you using the right metrics? Ensuring timely completion of projects and controlling costs requires project monitoring. The approach may be informal, but assessing status in some way during the life of a project is universally accepted as necessary. The problem is that commonly practiced methods result in unactionable, or worse, optimistic and misleading information. There is a better way. Any organization that manages projects must have some kind of a plan going in. The plan may be no more than a loosely defined list of major activities or deliverables along with a rough idea of how long it will take and how much it will cost to complete them. Monitoring progress may be as simple as getting a verbal update from the team during regularly scheduled status meetings. This situation, although quite common, eventually becomes unacceptable. The monitoring process will keep the team focused on getting the work done but it will not provide a timely indication that a change in direction may be needed to ensure success or avoid failure. In fact, whether the project effort was worthwhile or whether it met time and cost expectations can remain unanswered questions until after the project has completed. Recognition of this problem usually results in a search for tools and techniques to help resolve it. These tools and techniques invariably involve measuring key status indicators during the life of the project. Unfortunately, the indicators most commonly selected are misleading. It depends. What if 75% of the work is supposed to be done by week 13? The problem with these metrics is they are easily misinterpreted. A project that is 60% complete after 60% of the estimated dollars and 60% of estimated duration have been consumed would appear to be healthy. The truth however, is that it is probably tracking behind schedule and over budget. 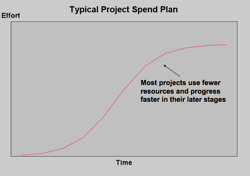 The reason is that most projects progress faster and with fewer resources in their later stages (see call-out: "Typical Project Spend Plan"). There is a simple solution to this problem which produces an accurate forecast, based on performance to date, of when a project will finish and how much it will cost. As stated, to understand the true status of a project at a point in time, we must compare actual progress against what was planned. There are two aspects of actual progress, each with its own ability to shed light on progress. The first is actual dollars spent which is sometimes incorrectly compared to planned dollars. What is the value of work completed to date? The second, called Earned Value, is the value (not the actual cost) of what has been accomplished so far on the project. When Earned Value is compared against actual dollars, the ratio produces an understanding of budget health. If actual dollars spent exceeds Earned Value, progress against the budget is not healthy. The work has cost more than what it was expected to have "earned". This ratio is called the Cost Performance Index (CPI). Note that unlike the Cost Performance Index, actual dollars versus planned dollars does not accurately assess budget health. This is because actual dollars spent does not necessarily reflect actual progress (eg: 75% of the dollars are spent but the project is only 25% complete). Comparing Earned Value against planned dollars produces an understanding of schedule health. If Earned Value exceeds planned dollars, progress against the schedule is healthy (i.e. the project has achieved greater value than was expected). This ratio is called the Schedule Performance Index (SPI). Use accurate forecasts of outcome to assess project health. The Cost Performance and Schedule Performance Indices can be used to predict when a project will finish and how many dollars it will consume with a fair degree of accuracy (see call out). It is important to consider the simplicity and ease of access to performance data when selecting a software solution. Some systems offer the ability to perform highly detailed and complicated Earned Value charts and analyses. These systems can sometimes be expensive and challenging to use because of their complexity. The best systems offer an easy to understand, instant snapshot that accurately reflects the true status of the project along with simple tools that enable you to quickly explain and act on problems. The simplicity and ease of the approach described in this paper is compelling. Little effort is required to understand the implications of forecasted cost, forecasted completion date or performance indices that indicate good health when greater than one and problems when less than one. Copyright Â© 2006 Indigo Technologies. Written by Shawn Nisenboim of Indigo Technologies. For more information about how you can painlessly implement Earned Value methods at your organization, e-mail us at sales@indigo1.com.